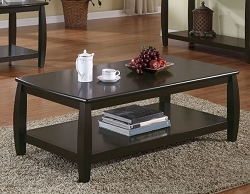 Finished in a rich brown, this casual styled end table and coffee table are the perfect addition for any room. Decorative slatted bottom shelf underneath. FL Comment: Assembly required, Good quality.